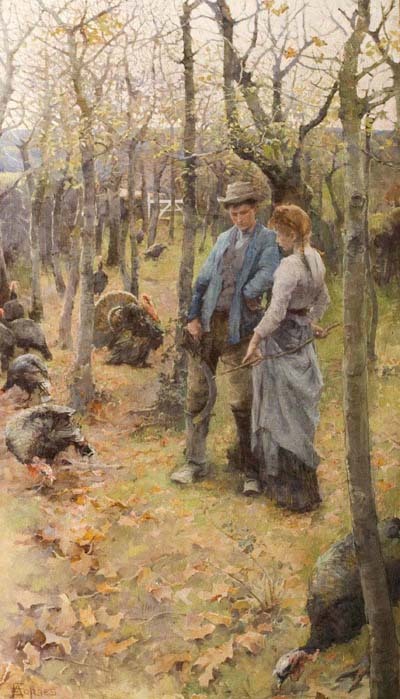 Summary: Oil painting showing a young rural man and woman standing amongst their turkeys in a wooded area. It is autumn- the leaves are orange and the trees are nearly bare. Description: In Newlyn, a small fishing village, Elizabeth and several other artists lived and painted the land and seascape. They felt the ideal landscape could be achieved by painting out of doors. The French 19th century artists who took their easels and worked outside influenced their work. They painted village life and concentrated more on the figures in their paintings than their surroundings. They often used local people as models. In Edge of the wood the verticality of the trees crowding the picture limits our view to the couple and their turkeys. The painting is stylistically similar to the Plein Air technique adopted by French artists during this time. With the introduction of oil paint in tubes during the middle of the nineteenth century, artists were able to go outside and work from life, rather than from preliminary sketches they had made and then reproduced on canvas in the studio. The Newlyn school, of which Armstrong-Forbes was a member, were heavily influenced by the work of Jules Bastien-Lepage, a French artist who was the leading exponent of the Plein Air technique. The use of large, square brushes further enhanced the dynamic approach to brushwork, and enabled artists to create a sense of movement and vitality. Description: Born in Ontario, Canada, Elizabeth Armstrong came to England to study art at the South Kensington schools, later studying in New York and Munich. In 1882 she went to paint in Brittany and in 1884 she was to be found in Zandvoort, Holland. Having heard of the growing art colony in Newlyn, she first visited Cornwall in 1885. 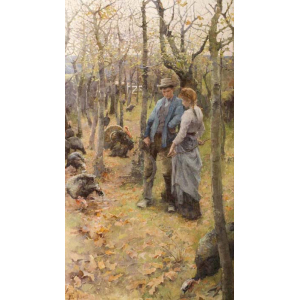 She met the painter Stanhope Forbes when she visited again the following year, and they married in 1889.